"Our theme this year is, 'See Further.' It reminds us that learning is only limited by our imaginations and our willingness to work hard to fulfil our dreams." In week 5 across our College, we will acknowledge Ash Wednesday to mark the beginning of the Lenten season. Our community will come together in prayer with staff and students receiving ashes on their forehead and an invitation to examine their lives, pray and reflect on the 40 days ahead. Lent also marks the beginning of our Project Compassion Campaign for 2017. This year the Caritas theme is, 'Love Thy Neighbour.' The campaign will help support communities in need and assist in breaking the cycle of poverty by empowering people with education, creating healthy environments to improve sanitation and providing access to medical facilities. I encourage all students to reflect and get involved with those less fortunate than themselves. On Friday 03 February, we were able to induct our Prefects for 2017 and present our 13 year students with their Tredecim Annis badge (Pictured Below). All these young men presented exceptionally well and our community can be proud of them. We thank the Prefects for stepping up to leadership and wish them well in their roles. We also thank the Tredecim Annis students and their families for making their lifelong schooling commitment to our College. 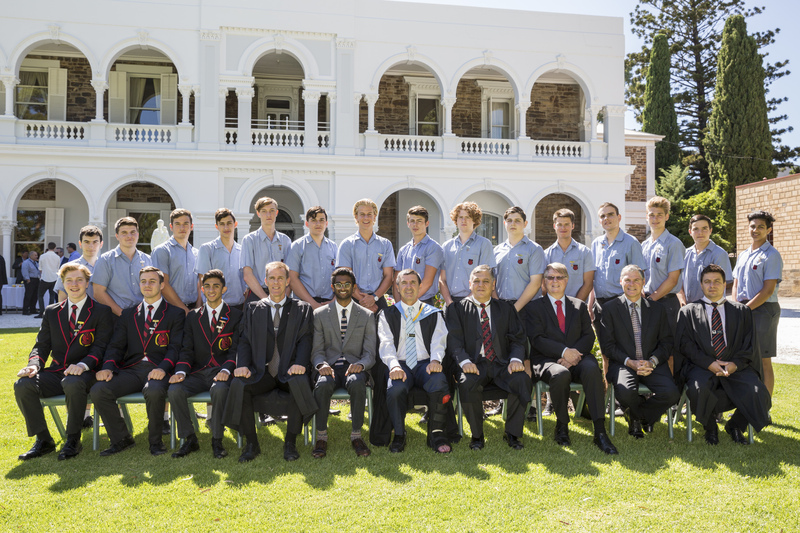 Front Row L-R: Jackson Sutcliffe, Nicholas Scheid, Damien Pipicella, Mr Geoff Aufderheide, Mr Mahendra Chitrarasu, Mr Damian Messer, Mr Frank Ranaldo, Dr Vin Thomas, Mr Terry Roberts, Mr Evan Pezos. I would like to take this opportunity to thank all members who participated in the 2016 Community Satisfaction Survey; attended the parent information evenings; and/or submitted an expression of interest for entry to our College Board. It's exciting to work with the community who value the home/school partnership and are willing to get involved with the College at all levels of engagement. The College looks forward to updating you as new community initiatives are rolled out and I encourage all to get involved at whatever level you feel comfortable. A brief reminder to our new community members that the New Parents' Welcome Drinks will be held tomorrow evening from 7.30pm in the Pavilion. I look forward to meeting our newest members to the Rostrevor family. The co-curricular program for 2017 is well and truly up and running. It is fantastic to see so many boys getting actively involved. In my visits to the venues so far, all of our students are participating with great spirit and exhibiting wonderful sportsmanship. I wish all of our participants well for the remainder of the Term 1 season. Thank you to all who have agreed to help in anyway. Having our students arrive and go home safely from school each day is an absolute priority of the College. The Parent Handbook clearly communicates expectations with respect to appropriate 'drop off and pick up' points. Subsequently, the College anticipates these will be adhered to by all families. We are also aware that often, extended family members help out with transport, so they also need to be aware of our expectations. Can we ask all parents to ensure all family members are aware of these drop off and pick up points. We thank you, our parents, who are overwhelmingly conscientious, patient, careful and cheerful at drop off and pick up times. Strictly no drop off/pick up on College grounds. Year 7-12 students are to enter/exit via the Main Gates (Glen Stuart Road), Gate 10 (Heather Avenue) or Gate 11 (Morialta Road). Staff members have been rostered to supervise these areas after school. Strictly no entry or exit via the Junior Campus, the Science Tech Building gate or the Agricultural Farm gate. Junior Campus students are to enter/exit via the Kintyre Road gates. Senior students with a sibling in the Junior Campus may enter and exit via the Junior Campus. There is strictly NO PARKING in the Drop Off or Pick Up Zone of the Junior Campus. Staff supervision commences at 8.15am in the morning and therefore students should not be on campus before this time. Please also be aware that the Adelaide Hills Council parking inspectors have been targeting drivers who break road/parking laws around the College. We have been advised that infringement notices will be issued. With the roadworks currently underway on Glen Stuart Rd, I understand that traffic has become a little more congested. I ask that parents are mindful of their speed around our two crossings (Glen Stuart Rd & Kintyre Rd) and I seek your support in showing extra care during the 3 week period of disruption. I thank you for your understanding and patience around this issue. Our first Principal's Tour for 2017 will take place from 9:00am on Thursday 23 February, and our annual Open Day will be held on Sunday 02 April between 1:00pm and 4:00pm. If you are speaking to others who are thinking about joining our College community, please refer them to our Enrolments Office or suggest they register their attendance to one or both of these events via our website. I would like to congratulate all the boys for making a strong start to the 2017 academic year. I encourage them to keep up their good work and make the most of all the opportunities presented to them.